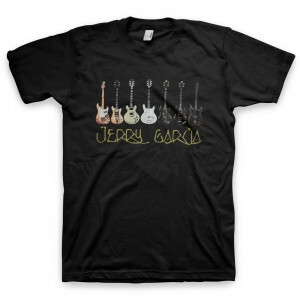 Showcasing Jerry’s iconic guitars on a black 100% organic cotton Anvil 420 t-shirt. Awesome shirt, I own many GD/JG shirts and this one is already my favorite. Lightweight fabric, yet well made. I got the guitars t-shirt and couldn’t be happier! The fabric is nice and soft giving the feel that it’s been on the road with me a time or two and is broken in perfectly. The image says it all... Jerry’s electric guitars, lined in a row!